So, you have made the decision to take the plunge into the world of aromatherapy. The enormous, confusing, and often expensive world of aromatherapy. The good news is – it doesn’t need to be any of that! There are so many oils out there in the marketplace it can be very overwhelming. Follow our step by step guide to ensure that you get the best quality at the best price. 1. Look for PURE ESSENTIAL OILS. There are so many oils on the market today that vary greatly in quality. There are synthetic fragrance oils that mimic an almost identical smell to the real oil, however they contain synthetic fragrances and will not possess the benefits of the pure oil. Then there are hybrid oils where the oil is ‘bulked out’ with cheap carriers like vegetable oils. The common labels these synthetic and hybrid oils are given is “fragrance oil”, “perfume oil”, or “aromatherapy oil”. In short, if the oil does not claim “pure essential oil”, then don’t buy it. All Tri Nature oils are pure essential oils of the highest quality. 2. Identify the DISTILLATION METHOD. To extract the oil from the source, there are a variety of different methods that can be used. Most commonly – cold pressing, steam distillation, or solvent extraction. Ensure that the pure essential oil you are buying is either cold pressed or steam distilled. Solvent extraction involves the use of harsh solvents to extract the oil from the source, and even though the solvent is eventually separated from the oil at the end of the process, it leaves behind an array of toxic residues in the oil you are looking to diffuse in your home or put on your skin. 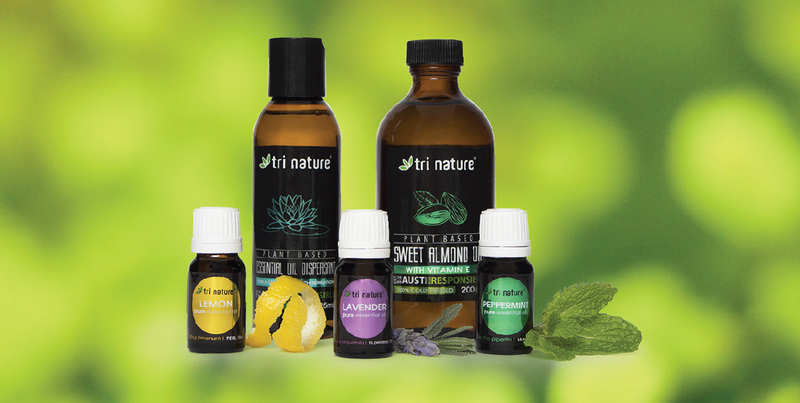 All Tri Nature pure essential oils are cold pressed & steam distilled only. 3. Check the BOTANICAL NAME. If you are seeking a particular oil, make sure you check the botanical name is the one you are after. There are multiple varieties of similar essential oils, and they can vary greatly in fragrance and benefit. For example, Roman Chamomile is very different to German Chamomile. You can find the Botanical name at the base of the front label of every Tri Nature pure essential oil. There are so many wonderful benefits to using pure essential oils in your home. These benefits have been documented for many thousands of years dating back to the early Egyptians, in a time when essential oils were the only remedies available for treatment of disease & ailments, beautification, and preservation rituals.